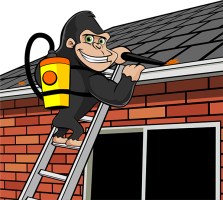 Pitt Meadows and Maple Ridge Gutter Cleaning is just one of the excellent property programs Gorilla Property Services has to offer. Gutter cleaning in these areas of the Lower Mainland is always busy. However, our most hectic time of year is the Fall. Ensuring gutters are clean, and that water is allowed to flow freely, gives our Maple Ridge and Pitt Meadows clients some peace of mind. If left untreated, gutter blockages and leaking can cause severe water damage to your property. The cost of repairs needed due to gutter neglect far outweigh the cost of having them cleaned regularly. Also, Overflowing gutters don’t just lead to structural damage. Depending on the surface below, the water can leave the area slippery with algae-like growth. All of our Pitt Meadows and Maple Ridge Gutter Cleaning technicians are equipped with top-of-the-range smart phones. This allows them to take immediate before and after pictures. Part of our service is being able to point out problem areas that may need extra attention. Doing this with high definition pictures, rather than having our customers climb a ladder, is just one way we stay ahead of the game. Pitt Meadows and Maple Ridge gutter cleaning services are available year round. Nevertheless, we recommended it is carried out at least twice a year (Spring and Fall). Of course, the frequency depends on the overhanging landscaping on your property. For instance, if you live around Fern Crescent or Shady Lane (the name says it all), you would require gutter cleaning services more often than someone right in town where there may not be as many overhanging trees. Regardless, a quick hassle-free inspection from our Pitt Meadows and Maple Ridge Gutter Cleaning Gorillas is free!